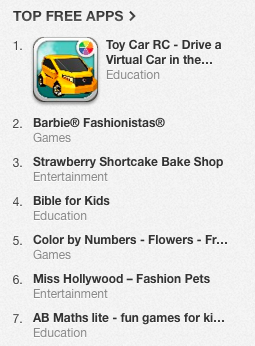 We are so proud to announce today that Toy Car RC reached #1 charts position on the App Store for the first time. Thanks a lot to all Toywheel supporters and to the whole Toywheel team for making this possible! Also, the app reached #3 charts position in the Kids and Education categories. If you want to know more about what is going on check out our brand new press Mini-Sites in German and English. Help us to move on – review & rate the app and download Toy Car RC today! Ready, Set, GO! PS. We promise – we will celebrate tomorrow a bit!